Elastomeric is an ideal insulation for hot and cold water systems. 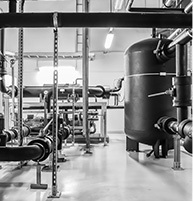 A closed-cell structure helps prevent heat gain and condensation problems on chilled water and refrigerant pipelines, it also prevents heat loss from hot water plumbing, liquid, and dual temperature plumbing. Aerocel AC is IMO/Solas, DNV, ABS and Transport Canada approved.